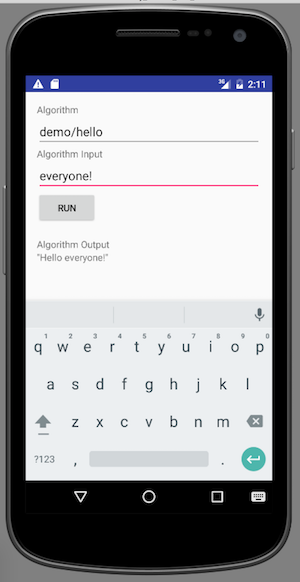 In this post, we’ll walk through how to build a very simple Android app that uses the Algorithmia API. You can either clone the repo directly and follow along with the README instructions to see the fully complete app, or you can follow the tutorial below to build your first Android app with Algorithmia! 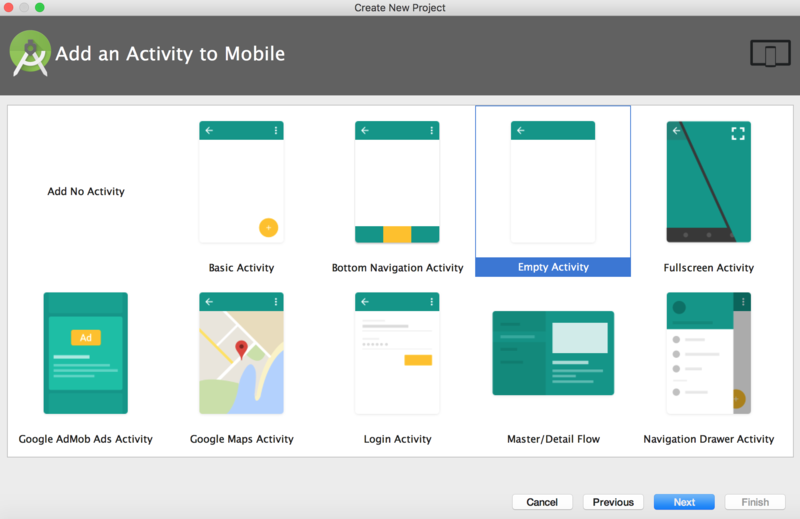 First things first, let’s create a new app in Android Studio. Since our app is just a simple example app, we’ll use put our code in MainActivity.java. But first, we need to do a little bit more set up. Follow the following 3 steps below to make sure you have the dependencies, permissions, and API key set as needed. In strings.xml, replace the demo API key with your API key, which can be found under the credentials section of your profile on the Algorithmia website. Make sure you’ve replaced YOUR_API_KEY with the API key under your account so that the Algorithmia client can authenticate! To make our sample app run, we’ll need to do four things: first, we’ll need to add a function that gets called when the button is tapped, we’ll need to add in an async task, make the Algorithmia API call, and finally update the UI with the results. If you noticed when we added the views to the app, we already set the button to handle the onClick event with this line: android:onClick="onClickRun". Android Studio will complain that this method doesn’t exist, so let’s create it now. We’ll also have grab the values of the EditText views so we can work with them. Notice that we are catching the API exception and creating a new Algorithmia Exception from it. We do this so that we can update the UI with the exception message in the onPostExecute method. Let’s do that now! What the above code does is set the algoOutput text view to display the results of the call. If the response is null, we’ve set the output to show a generic “network connection failed” message. Following this, we’ve got a check on line 5 to see if the condition is successful, and if so we’ll set the text to the success response. Of course, we’ll also need to handle the failures, which you’ll see in the final else of the method on lines 8-10. You can find the full code for MainActivity.java on GitHub. Double check that your code matches the code in the repo! Now that you’ve got your first Algorithmia Android app running, try replacing the demo/Hello algorithm with another that you find on the marketplace. Try something like anowell/pinky or diego/RetrieveTweetsWithKeyword. Then make sure the input you provide to your new algorithm matches the expected input, and hit run! Integrating Algorithmia into Android is an easy and convenient way to leverage algorithms, so now that you’ve got the basic API integration down, you can follow this pattern to start hacking away at your own apps!